The Public Works Facility is at 15500 Allendale Lake Road and the Public Works Office is at 10 Winnebago Drive. The Allendale Lake Road facility is a secure location due to the location of the water tower and the water treatment facility, therefore all Public Works business is conducted at City Hall, 10 Winnebago Drive, Phone (816) 537-6778 Fax (816) 366-0089, Monday – Friday 8:00 a.m. – 12:00 & 1:00 – 5:00 p.m., after hours emergency number is (816) 537-7900. The City sewer system is connected to treatment facilities provided by Little Blue Valley Sewer District. Some homes are connected to gravity sewer mains and some homes are connected by grinder pumps to force mains. Grinder pumps are considered to be part of the homes sewer service line and the property owner is responsible for all installation and maintenance of the sewer service line from the home to the City sewer main. The City cannot recommend companies that do this type of work, but we do keep, in City Hall, a list of companies that have worked here in the past. The City has always provided assistance to our residents to help resolve any sewer or water problems in the home. Actually, we prefer that you call us first at (816) 537-6778 and we may be able to help you to resolve the problem. Public Works has an ongoing street and curb repair and construction program. Each year we choose, based on condition, street and curb repair and replacement projects. We Keep a running list of known problem areas and you can report any concerns by calling (816) 537-6778. Water is supplied by Tri-County Water Authority, 28404 Blue Valley Road, Independence, Missouri 64058. Fluoride water treatment is provided by Lake Winnebago Public Works at 15500 Allendale Lake Road, Lake Winnebago, MO. All accounts are billed monthly and due the 20th of the month. What should I do if I do not agree with my water bill? Please call City Hall at (816) 537-6778 to speak with a billing clerk who can review the bill with you. Occasionally, high water bills represent a plumbing problem such as a leaking flapper in a toilet or other potential leaks within the customers system. Our staff may re-read the meter or have you perform a leak test on your toilet. Does Lake Winnebago Water Utilities offer payment arrangements? Do I get charged a fee for late payments? Yes, Water/Sewer bills are due on the 20th of the month. Any balance left on the account after the 20th will be charged a 10% penalty. Is there a fee if my service is shut-off for non-payment? Yes, a re-activation fee of $100 must be paid along with any past due amounts to have service reinstated. This fee covers the additional expenses involved in reinstating the service. Is there a fee for online payments? Yes. We offer the services of a third party vendor for online and phone payments. This fee is their convenience fee, and is not paid to the city. I received a shut-off notice; what should I do? Shut-Off notices are posted at the residence on the 10th for past due balances prior to the customers current bill due date. The Shut-Off notice will provide a date to make full payment. Customers should make full payment through the night depository, on line or in person to avoid any delays in the posting of their payment and potential interruption of their service. We offer several methods of payment to assist our customers, including US Mail, bank account drafting (ACH), telephone, online, night drop box, and in person.Bank Draft: A Bank Draft payment option is provided free to our customers and allows you to have your payment automatically drafted from your checking or savings account. To take advantage of this payment option, please print the Authorization Agreement for Direct Payments Form and mail, or bring it in with a cancelled check. (PDF link in utilities)Mail: Simply detach the right hand portion (remittance stub) from your bill and enclose your check or money order in an envelope. Address the envelope, to City of Lake Winnebago, 10 Winnebago Drive, Lake Winnebago Mo. 64034. Please allow adequate time for your payment to arrive.In Person: City Hall is located at 10 Winnebago Drive. Office hours – 8:00 a.m. to 5:00 p.m. M- F. Closed from noon to 1:00 p.m.Night Depository: A metal lock box is located at the northwest edge of the City Hall parking lot. Please NO CASH.Telephone: Payments are processed through a safe, secure and convenient telephone system that can be accessed 24 hours a day 7 days a week. Have your account number ready when you call (877) 793-7144. NOTE: This is a third party vendor, and they do charge a small fee.Online: As with Telephone payments, the system is safe, secure and convenient to use. Fees do apply. Go to www.lakewinnebagopayments.com. Some leaks are easier to find than others, such as a dripping faucet or a running toilet. If you suspect a toilet leak, but do not hear it running, a good way to find out if the toilet is leaking is to place a water test coloring tablet in the tank and wait a few minutes. If the water in the bowl turns color, you have a leak and the flapper probably needs replacing. Tablets are available free at City Hall. Other leaks are harder to find, especially if they occur outside or underground. Remember, any leak that occurs between the meter and the home is the home-owners responsibility to repair. 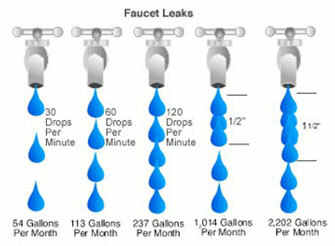 Even a small leak can have a significant impact on water loss, which will increase your water bill accordingly. See the chart for an example. If you experience issues with water taste, clarity, pressure or no water at all then call City Hall at (816) 537-6778 and a Public Works employee will address the problem. The City of Lake Winnebago is responsible for preventing contamination to the public water system caused by back-flows into the system. This responsibility begins at the source and includes the distribution system and ends at the user’s connection. The user is responsible for keeping contaminants out of the potable water system at their residence. They also are responsible for preventing modifications that could potentially create cross connections. A major fire, a leak, or other high demand event like a pipe break may create negative pressure (vacuum) and a back-flow condition. To see some simple pictures of actual events and explore options for lowering the possibility of a back-flow or cross-connection go to: https://media.wattswater.com/f-f-ccch.pdf. This simple click of the mouse could save a life or prevent an illness. Currently the City follows the DNR guidelines requiring a minimum of a Double Check Valve at all Class II sites such as: lawn irrigation, water features and swimming pools connected directly to the potable water system. These devices are to be checked annually by certified personnel and are the responsibility of the homeowner for the purchase, installation and maintenance of these devices. The City is required to keep annual records of testing results for all sites and must take action when violations occur. Keep in mind that the location of the back-flow device is important, it must protect the city main and the residence. If you need assistance call City Hall for more information. We are committed to supplying you with the best water available. Many have sprinkler heads are below ground level, allowing water with fertilizers and weed killers to be siphoned back into the water system. In California, a man was spraying commercial weed killer containing Arsenic on his lawn with a applicator connected to the garden hose. When he had finished spraying he turned off the hose, disconnected the applicator, and since it was a warm day he turned the hose on to get a drink and he later died of Arsenic poisoning. While he was spraying a back-flow condition carried Arsenic back into the hose. The use of a garden hose can create a problem when used in a perfectly normal situation. A man uses a hose to blow out a stopped up sewer line, but with a sudden drop in line pressure, contaminated water can be drawn back into the potable water system.